The Cumberland & Dumfriesshire Farmers Mart P.L.C. had forward 6,248 Store Lambs (including prize show and sale for Cheviots & Blackfaces) at their weekly sale at Longtown on Wednesday 15th September 2010. Store lambs easily maintained late rates with a top of £70 for Texels from Carpet Farm, £66.50 Scaurbank, £64.50 East Foreshield, Suffolks to £64 Caulside, £58.50 Carlenrigg. Greyfaces to £58.50 Carpet Farm, £57.20 Stonehall, £55.80 Cooks House; Halfbreds £57.50 Jury Park; Swaledales £43.20 Woodside, £40.50 East Keilder. At the special show and sale of Hill Cheviots & Blackfaces judging was in the capable hands of David Stamper, Chipping, Lancashire. An exceptional show of lambs in both sections met a fantastic trade from a full ring of local and distant feeders. Other leading prices were £58.50 Gillespie Farms, £55.50 Winterhope, £55 Meikledale & East Deloraine, £54 Cooms & Whitefield. Other leading prices £49 Earlshaugh, £48.50 Brownhill, £48 Blacksmiths Cottage, £47 Dalveen & Glenbeg. 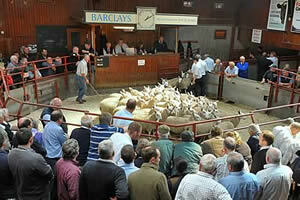 Breeding ewes to £102 for correct Texels from Carpet Farm; Greyfaces (correct) £69.50 Caulside. Cast rams £60 Carpet Farm; Blackfaces £55.50 Black Mountain who also sold cast rams at £67 for Blackfaces.